Is China’s AI industry much ado about nothing? Investment in China’s AI companies has plummeted after hitting a high in 2017, amid inflated valuation and unfulfilled promises. In July the research firm ABI Research released a report tracking investment in AI. China’s AI industry attracted $4.9 billion private sector investment in 2017, overtaking the US for the first time as the world’s biggest AI investment destination. 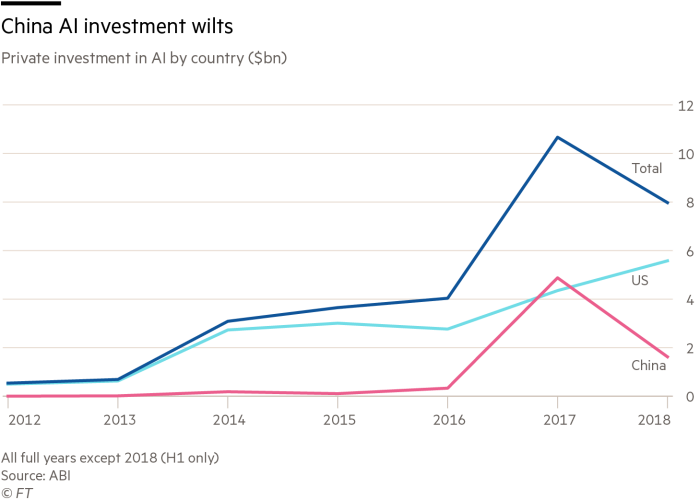 Barely four months have passed when the firm published an update to show that the investment in China’s AI sector has plummeted in the first half of 2018, attracting only $1,6 billion, less than one third of the level of its biggest rival. A couple of factors may have contributed to the decline in the investment level. Valuation of start-ups has soared. According to Kai-Fu Lee, a former Google senior executive who nowadays runs a venture capital investing in China’s technology sector, the reasonable valuation of a typical AI start-up in China is less than half of the price level it was a year ago. This may well have put off some investors. But specialised AI products are hard to come by and take a long time to develop. So, some companies chose to take a short-cut to show their progress. Natural language processing is one such competitive sector. Not too long ago a controversy arose when a simultaneous translator claimed that the company that hired him at a conference in China used a voice-to-text engine to display his translate to the conference audience, pretending the live speech was AI machine-translated. The company explained that it was using a hybrid solution. The much hyped, and feared, “social credit” system is also moving at a slow pace. Recently a university in southern China, instead of using AI to troll internet traffic, decided to resort to the analogue way of detecting dissent: it required all students and staff to hand in their computers, mobile phones, and USB sticks to be inspected by the school authorities. It backfired badly, and the university told the media that it would “rethink” the scope of its approach. At the end of the day it falls to the technology heavyweights rather than the start-ups to take charge. Huawei and Alibaba have both started developing their own AI chips to shore up its vertical integration capability. This will take much longer than developing a gimmicky application, hybrid or not, but will be much more specialised and more powerful, especially supported by the large amount of data the companies possess.